Lionel Messi has now scored 100 Champions League goals in just 123 appearances, 14 games fewer than it took Cristiano Ronaldo (137) to reach this milestone. 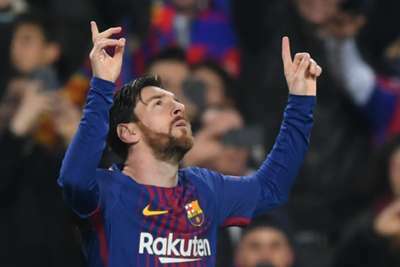 Lionel Messi became only the second player to score 100 Champions League goals with a double against Chelsea at Camp Nou on Wednesday. Messi started the game on 98 goals in the competition but opened the scoring in the third minute, rifling through the legs of goalkeeper Thibaut Courtois from a tight angle. The strike, which came after 128 seconds of the game, was the fastest Messi has ever scored for either club or country. And the Argentina superstar brought up three figures in the Champions League after being teed up by Luis Suarez, driving another finish between Courtois' legs. Messi is still lagging some way behind great rival Cristiano Ronaldo, who is the only other player with at least 100 Champions League goals. Ronaldo, who has hit 117 goals in the competition, has struck 12 of those efforts in this season's tournament. However, Messi reached his century in 123 appearances, while Ronaldo needed 137. As an arsenal fan,i don't know if I should mock these people or jejely shut up my mouth,because this kind of feeling I'm having right... Man Utd is down, Tottenham is down,chelsea is down... Nor be arsenal remain? Never remind MESSI what he has not done. Chelsea fans reminded him that he needed to score Chelsea.....that he did clinically. NIGERIANS reminded him of Vincent Eynama, he did it clinically. MAN U....reminded him he did. ARSENAL never reminded him, yet he did. This match has shown that Barca is a good team but not that good. This Barca team is not that good, but Chelsea is something else. Barca should pray that they don't meet City or Bayern..
Angers. wrote: This match has shown that Barca is a good team but not that good. This Barca team is not that good, but Chelsea is something else. Barca should pray that they don't meet City or Bayern..